It is subtle at first: the ‘yes’ to that exciting new project; a nod to take on new levels of parenting (whether you feel prepared to do so or not); the impertinent weather that smacks your windshield as you navigate new roads to pick up loved ones. Then it hits you. You have lost the alignment you exceedingly crave, that fine line between enough and too much. It comes in waves, washing over you with the tides of your life. You drift, seemingly alone in the morass of demands. You can sense the faint music reaching your ears. Perhaps it is a hand-crank organ pipe and you its monkey, dancing on the fringe of things. To which music do you dance? To whose rhythm does your heart beat? I hope it is your own, and no one else’s. Slow quote: How many people’s bus do you ride? If you haven’t discovered Late Bloomer Bride, yet, you are in for a ride! It is full of life’s wisdom. The blogger has a most cherished wit that routinely lands me on the floor ~ rolling. I was a late bloomer in every way possible, except for the bride part (I got married at 25). Her quote of the week will give you a taste of her offerings. This particular quote’s message serves as a marvelous intersection between mid-life issues and the power of slow. How many people’s bus do you ride? Are you in one or two? Do you show up for all your friends or for only a select few? Would you rather have a large circle or a few intimate people to accompany you on this journey? I have a few bus-riding friends. The rest, I would guess, would enjoy the champagne and the limo ride, too. It’s the ones who stay after the party to help clean up that count as my closest buddies. Yoga Living magazine’s Robert Butera provided these great lifestyle tips disguised as how to get more out of your yoga practice. He recently authored the book The Pure Heart of Yoga: Ten Essential Steps to Personal Transformation. Honestly, you can apply these tips to your life, too. You needn’t be a yogi to benefit. In fact, Robert says it’s better to focus on the inner transformation first, which, in turn, allows the external one to unfurl. You betcha. Robert is a fan of taking it slowly. So give it a read, then tell me what you think. Step 1: Intention. Setting an intention to practice yoga immediately connects your mind and body to the practice in one seamless unit. From beginners to advanced students, practicing a yoga pose with a specific intention in mind brings power and focus to both the yoga and your intention. Step 2: Attitude. Closely aligned with your intention for doing yoga, an awareness of your attitude helps you connect with the nonphysical essence of yoga pose practice. Maintaining a positive attitude while you practice will improve your yoga pose experience — and your daily life. Step 3: Posture. Attention to the correct physical alignment of yoga poses improves the nervous system; the musculoskeletal system; the digestive system; the circulatory, immune, respiratory, endocrine, and cardiovascular systems; mental function; and emotional health. I recommend attending a yoga class when possible to have an experienced yoga teacher further assist you with physical alignment. Step 4: Breathing. Learning how to breathe very deeply is the one of the primary benefits of a yoga practice. Breath control increases oxygen in your blood, instantly reduces stress, brings clarity of thought, and stills the mind. You will find that doing different types of breathing exercises when you practice the poses will change your experience dramatically. Step 5: Archetypes. Yoga poses are based on things observed in nature and in the human experience. By understanding the story of each yoga pose and where it comes from, you can develop a deeper perspective on yoga by discovering the qualities that are inherent in the pose – and how to apply or internalize these characteristics in your practice and in your life. Step 6: Energy Centers. This step explores the mind-body connection of the chakra system (energy centers), and how different yoga poses stimulate energy flow to these chakras in different and powerful ways. This is a vital component in learning how to deepen your awareness of the relationship between your body and mind. You can use the poses to address specific health conditions or weaknesses in your body. Step 7: Concentration. This step lets you explore the distractions in your physical environment and mental landscape that are keeping you from achieving a deep meditative state. The better you get at applying concentration techniques, the more profound your yoga experience will be. Step 8: Energy Seals and Physical Locks. Step 8 delves into the power of symbolic energy seals (mudras) and physical locks (bandhas) on the body to deepen your awareness of the body’s energy. This step will help you understand subtle energy and how to consciously understand the flow of energy throughout your body – and is particularly useful for advanced students to combat “yoga burnout” or “yoga boredom,” as it helps them cultivate a beginner’s mind. Step 9: Psychological Blocks. Yoga has the power to help you see aspects of yourself more readily than through thought or self-reflection alone. In this step you explore afflictions of the mind (klesas) and identify obstacles in your psychology that may be keeping you from moving ahead in your life and your yoga practice. Step 10: Emotional Transformation. This step teaches you how to transform emotions to master the ego and merge with the infinite. Practice these concepts and you will learn new ways to manage your daily life. Treat these steps as a gateway to experiencing the richness that yoga has to offer rather than as a strict, methodological program. It is a template that will grow with you over time as certain steps become more relevant at different times in your life than others. Be careful to not be in a rush to experience all the benefits that these 10 steps have to offer. Enjoy the process and honor your patience, and in doing so, you will notice shifts in your practice in the months and years to come. Robert Butera PhD is author of The Pure Heart of Yoga: Ten Essential Steps to Personal Transformation (Llewellyn, $21.95), publisher of Yoga Living magazine, and director of The YogaLife Institute in Devon, Pennsylvania, where he trains yoga instructors as well as students. Visit http://www.pureheartofyoga.com for more information. Poll ~ Is Multitasking a Must or a Myth? People seem really divided on this issue. Debunking scientific research that proves the brain can only concentrate on one thing at a time, people clamor to this notion of multitasking. So seriously, folks. Take the poll. Your voice counts. Shout it to the world. I want to know! What brings you joy? I’d love to know (and Oprah would, too, so once you’ve told me, pop over to her site to tell her as well!). The trader nervously tapped his pen on his desk as he viewed three monitors seemingly at once. Driven by his own ambition, he attempted to absorb the thousands of data points coming at him every day, until his mind became so jumbled that he made a vital mistake that cost his client millions. It is a scene that plays out more often than we care to realize. People who have a hard time filtering information are often fearful of missing out. Wall Street traders, in particular, are often haunted by the thought of missing the ‘big fish’. They become distracted, bouncing from one realm to the other. The good news is help is on the way in the form of one psychologist who has designed a way to sharpen their focus in eight simple steps. Sports psychologist and peak performance coach Dr. Doug Hirschhorn works with Wall Street executives to help them improve their performance. In his new book 8 Ways to Great: Peak Performance on the Job and in Your Life, Dr. Doug outlines the eight performance principles he uses to coach today’s front-line performers in the toughest corporate jobs. “Time is [a trader’s] only commodity,” he told me in a Skype interview. “Their number one priority is to make money and to generate substantial profits.” When feeling time-starved, people tend to make rash decisions based on emotion, not information. Self-awareness is the first step to change, he said. He examines the trader’s personality to see where his or her strengths lie. “I help them slow their thinking process down,” he admitted. While many of them are moving a mile a minute, he helps them identify what they do best, then counsels them to concentrate on only that thing. “If you are an expert in oil, don’t trade corn,” he quipped. The key to success lies in focusing on one thing at a time. Kill the multitasking beast. But how? Because we were on video conference mode, he gave me the perfect visual to end the multitasking nightmare so many of us engage in. He grabbed a fistful of pens. “When I toss them into the air, try to catch them.” Obviously, I couldn’t, but I got the picture. Then he suggested I concentrate on only one of the pens. When he does this demonstration during his presentations, inevitably the participant manages to catch the one pen because the person is focused on that one thing. That’s why multitasking doesn’t work. We try to grab all the pens at once, thereby dropping them all. We are driven by the fear of missing out and then being held accountable when things don’t work out. “The phrase I can’t is merely avoidance of accountability,” he admitted. People who attempt to multitask are really avoiding accountability. The reasoning is if you concentrate on 100 things at once, it is easier to hide your mistakes. 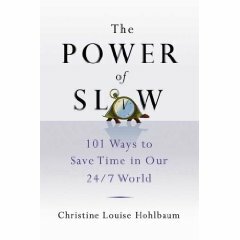 The power of slow provides us with an opportunity to slow down our thinking to examine our strengths and to play to them as best we can. When we learn to delegate, we free up the time it takes to grab the ‘right pen’~ every time.